The Weatherization Workforce Training program is divided into three tracks - for Installers, for Crew Chiefs and for Auditors - each designed to address the core competencies defined by the Weatherization Assistance Program (WAP) and recognized by the Building Performance Institute (BPI). 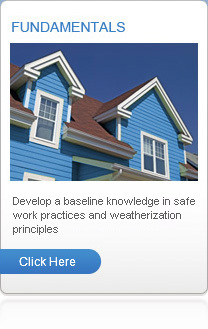 The training tracks stand on their own as a description of the scope of work, and of cost-effective measures and safety practices that weatherization professionals should expect to employ on weatherization worksites. Each track also contains a preliminary training series aimed at reinforcing baseline knowledge in the fundamental concepts needed for weatherization work. 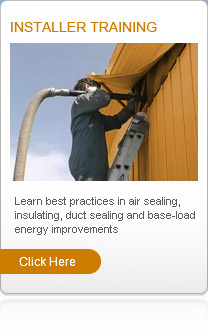 This training track introduces prospective weatherization Installers to best practices in air sealing, insulating, duct sealing and base-load energy improvements for conventional homes and mobile homes. In addition, Installers will be introduced to the essential concepts in building science that are needed to help them understand not just how, but why particular measures need to be taken to improve the energy efficiency, combustion safety and indoor air quality of buildings. This training track offers prospective weatherization Crew Chiefs with a strong working knowledge of the building science principles and project management skills necessary to direct weatherization crews. 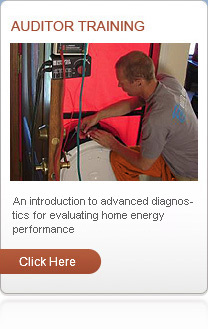 It is designed to build on the concepts presented at the Installer level of training, providing a deeper understanding of the physics that control the transfer of heat and moisture through buildings, and greater familiarity with pressure diagnostic tools and combustion appliance safety protocols. This training track introduces prospective weatherization Auditors to the advanced diagnostic and inspections required to conduct an accurate energy audit and write detailed building reports. It is designed to build on the concepts presented at the Installer and Crew Chief levels of training, allowing prospective Auditors to understand buildings as whole systems and demonstrate the capacity to evaluate problems and establish cost-effective solutions. 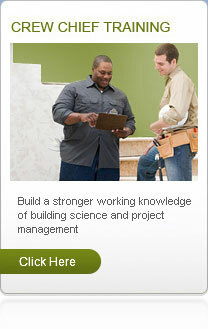 © Wx Workforce Training, All Rights Reserved aws prod.